Here in London, an unusually interesting political race is gathering pace with two colourful candidates facing off to become the next Mayor of London. In the red corner, incumbent mayor and noted left winger Ken Livingstone (pictured left lurking behind Hugo Chavez), and in the blue corner, iconoclastic Conservative Boris Johnson. Incumbent Mayor Ken Livingstone has been around an eternity it seems and is a passionate working class Londoner, who is not afraid of change. In 7 years of office he has introduced the controversial congestion charge, reducing traffic on London’s roads by 26%, and has ploughed much of the money raised into public transport. He also took a key role in helping bring the Olympics to London in 2012. While he is not a particularly likeable character he ‘gets things done’, and most Londoners approve. Boris Johnson on the other hand is extremely charismatic, in a playful, self-deprecating, and mischievous way. This makes him popular with students and other people alike, and unquestionably one of the most interesting politicians we’ve had in this country in decades. When Boris Johnson announced his candidacy for Mayor a month ago, Ken Livingstone became worried. In the past, Ken Livingstone had barely any concerns with re-election, as there simply weren’t any likely candidates up against him. This time however things are different, and Ken Livingstone has a fight on his hands. 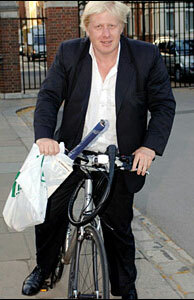 Although surprisingly little has been made of it in the British press, he has begun acting in some rather extreme ways since Boris showed up on his bike and declared his candidacy. A few days ago Ken Livingstone announced that Londoners on income support (welfare) would be able to travel for half-price on London’s bus network, effective immediately. Starting next month, all Londoners will benefit from an across the board reduction in public transport fares of 10%. The whole thing has a stench of bribing the electorate, to grease voters in advance of the Mayoral elections. But the MOST insane thing about these announcements is how he is going about it. 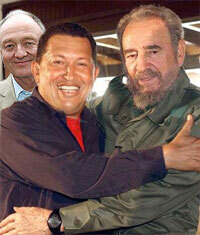 In short, Livingstone has signed a deal with probable dictator-in-the-making Hugo Chavez, President of Venezuela, to get cheap oil to run London’s busses, in return for some consulting services on how to run a city. If you don’t know much about Hugo Chavez, on the one hand he has acted like a modern day Robin Hood, stealing money from Western oil companies to give to the poor. On the other, he is exhibiting all the classic signs of a future dictator in the making. If that isn’t dictator-in-the-making behaviour, I don’t know what is. But this isn’t an argument over the pro’s and con’s of Hugo Chavez. The point is that the Mayor of London, has unilaterally done a deal with, at minimum, a highly questionable foreign leader, to finance a bribe of the London electorate, in a way that is remarkably similar to Hugo Chavez’ own bribing of the Venezuelan poor. How such a story has managed to gain just a handful of articles in the British media is beyond me.